Daily Dose of Design: Decorating a space with vibrant and bold colors! Happy Tuesday and more importantly - happy JUNE!! It's been a couple super rainy days in New York so I've been stuck inside! But I've been shopping to find the last finishing touches to my bedroom makeover and I realized how awesome it is to have a vibrant touch to any room! No matter what color scheme or look you're going for, I think having some pieces that really pop in a room make it inviting and bring a space together. Going vibrant, bright and bold for a room is important to be done right, especially if you're going bold with your paint choice! 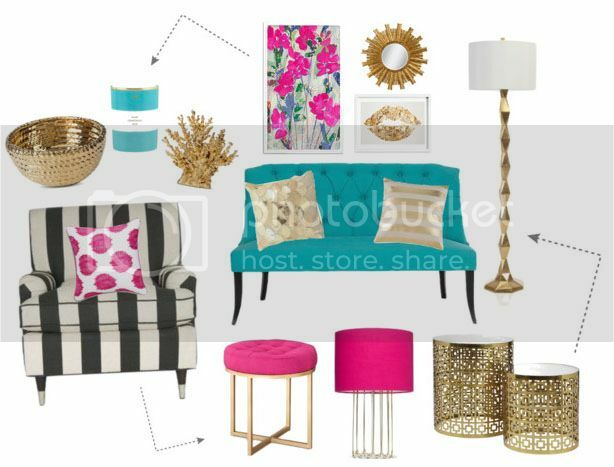 BLack, gold, pink and turquoise is one of my absolute favorite color combinations! Taking vibrant colors like these and mixing them with a more subtle color (like black) goes together like PB&J in my opinion!! 1. Stick to a scheme: While I've seen rooms that have a broad color scheme and look GORGEOUS, I prefer rooms that have a set scheme with a small handful of matching colors. 2. Going bold on your walls: If you have a vibrant/bold color on your walls, I bet it looks awesome! If you aren't as comfortable doing a whole room with one bright color, try doing an accent wall! It makes the room pop perfectly, just not as risky as a whole room. If you go bold on the wall(s), try more subtle accents and decor. 3. Light up a room using the floor: If you're starting from scratch, consider going graphic with your flooring! I love a herringbone patterned floor like this one especially for a bathroom. It gives depth and pattern - without making too much of a "bright" statement! Or for a bedroom or living room, try a brightly patterned area rug like this one! 4. Vibrant patterns in a small way: I think a great way to somewhat-subtly make a statement is to DIY a bookshelf to look similar to this! Making a statement while keeping it understated all at the same time! 5. Go bold with bedding: If you're looking to make a statement in your bedroom, a great way to do so is getting a brightly patterned bed set within your color scheme! Chevron, ikat, stripes and paisley prints are all great ways to go. 6. All in the textiles: As you can see above in my current dream living room, I'm all about the wall art and patterned pillows!! Having a bright (or even neutral) colored sofa, mixed with a patterned accent chair and some gorgeous textured and patterned throw pillows makes me SO happy! Bright wall art also can make a room pop - especially a floral design that matches your color scheme to a T! But for real - how gorgeous do those details look together?! 7. Last but not least, lamps: While it's important to have lamps for ample lighting in any given room, these are also some of the most important decorative items too! Try a patterned lamp shade for some real POP! I especially love a bold colored shade like this one. I love vibrant colors and patterns, especially lately. Here's some of my favorite vibrant products to dress and fill up any room! ah what I would give to let you design my house...lol Love it all!! I definitely want to do the gold + pink +mint colors in my bedroom. I love those colors. Love the bold stripe on the chair and the turquoise sofa with the gold accent pieces. Really makes a statement. You have a exquisite taste, love the throw pillows, I'll make sure to use youy when I need redecorating! What a clever design. Thanks for sharing it at the #AnythingGoes Link Party. the designs are great and I love the colours. Thanks for sharing these tips with us at #AnythingGoes link up. I have lots of pops of pink at my place so I love your ideas! I also love that pink chair.